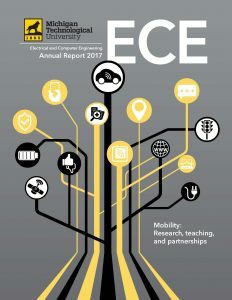 We are happy to share with you our newly released ECE Annual Report 2017. A look back at our past year highlights research activities from nine of our faculty members in the area of mobility, along with graduate students Mojtaba Bahramgiri, Derek Chopp, and Mehdi Jafari. We share in the good news received during the year in which three of our assistant professors received major early career awards: Lucia Gauchia and Zhaohui Wang received National Science Foundation CAREER awards and Jeremy Bos received the US Air Force Young Investigator Program award. We highlight two of our many outstanding undergraduate students, Brian Flanagan and Casey Strom, for accomplishments and contributions during their BS degree studies. This May we celebrated the 50th anniversary of the first female graduate of the Michigan Tech EE department, Pat Anthony. Pat was honored by the University during spring commencement and was also inducted into the ECE Academy. Once again the year included a wide variety of hands-on student projects in our Senior Design and Enterprise programs and we thank our sponsors for making it all possible! We invite you to read about these stories and more. From all of us at ECE, happy holidays and best wishes for 2018!